The recent Esri Developer Summit (DevSummit) in Palm Springs brought together thousands of developers and GIS professionals from all over the globe. Attendees learned more about building and successfully launching applications built upon the portfolio of tools, components, and software that Esri offers, and had a chance to network and exchange ideas with development team members and peers. Many Web and mobile developers outside the mostly GIS-oriented community that attended the DevSummit may not be as familiar with these solutions, but they certainly should be, and this was my theme at a recent keynote at the Where 2012 Conference. It’s now possible to leverage and tap into the power of GIS maps and capabilities without having to install any software, or manage hardware and infrastructure. By using ArcGIS online in the cloud, any developer can successfully build and deploy Web and mobile applications without needing anything but a Web connection—one way to think of it is that it’s GIS, but without the box. There are millions of GIS users across the globe applying GIS to a very diverse set of tasks and problems, from managing infrastructure, responding to disasters, conservation, natural resource management, planning growth, geodesign, evolving a business, and much, much more. To meet these diverse needs and our community of users, Esri has continued to grow and evolve GIS since its inception. Factoring into this landscape is the evolution in hardware platforms and operating system, the emergence of standards and the importance of mobile devices, and expectations about how we experience and interact with geospatial information. This evolution has lead Esri to move GIS to the cloud. Clearly this is an ongoing process, and has been evolving for years and has received a great deal of investment and attention. But now GIS users are rapidly adopting this cloud-based system and are successfully leveraging it, and it’s fundamentally changing how we think about and implement GIS. The benefits are also beginning to be realized in the form of greater transparency, better and easier access to geospatial information, public involvement, and collaboration. This has also resulted in more efficient ways to serve users within and throughout organizations, between organizations, and also serves a broader public audience. It’s helping to unlock the full potential of GIS for everyone. 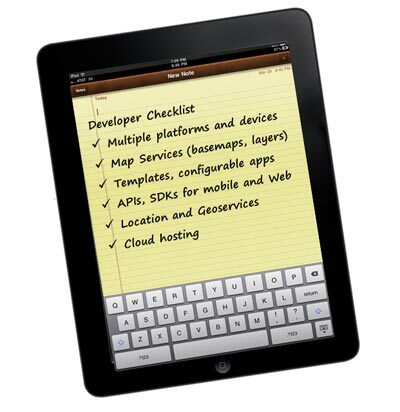 This same platform supports all Web and mobile developers with a full suite of tools, capabilities, and options, providing developers seeking to build geo-enabled apps everything needed on their checklist. An important feature is that these are not limited to a specific device, platform, or ecosystem, but can be used to support multiple needs and audiences. Map services – many different basemaps and layers to choose from, compiled from the best and most authoritative sources. Basemaps include imagery, streets, topographic, oceans, National Geographic, and specialty basemaps like the light gray canvas map, and more. Other maps you can use include a broad variety of demographic maps including the highly valuable USA Tapestry segmentation map. You can find out about more by visiting the map and geoservices website. Configurable templates and applications – you don’t have to start from scratch, you can leverage configurable apps and templates that provide a jump start to your final solution. These capabilities represent a strong platform for both GIS-oriented developers and also for those working “outside the GIS box.” But this platform is also developing rapidly and we can expect more GIS services and capabilities as it evolves, making the Web and mobile developer landscape exciting indeed.